Cuba is facing an energy crisis today. Efforts by the Government of Cuba to purchase and install small generators seem like an attempt to get quick results without an analysis of long-term costs. At this time, energy consumption is heavily subsidized, something that is possible thanks to Venezuelan subsidies (estimated at US 2 billion per year), which have partially substituted for previous subsidies from the Soviet Union. While these subsidies allow electricity tariffs to be maintained at very low levels, it is highly unlikely that Venezuela will continue to provide support if Cuba becomes a democracy, and a free market economy. If Cuba becomes a democracy and a free market economy, the necessary reform of the power sector will face a number of issues, the most critical being the need to increase electricity rates sharply in order to reach full cost recovery. The paper argues that Cuba should rely almost totally on the private sector to provide power but reaching this situation would require, inter alia, the establishment of an adequate legal and regulatory framework. Managing the transition from a state-owned system to a largely private one will be a critical issue that is discussed extensively in the paper. The paper identifies three types of activities that would need to be implemented, which are: (A) establishing the “rules of the game,” including the establishment of a regulatory agency and raising tariffs; (B) increasing the efficiency of state-owned enterprises in the power sector, including the development of incentive-based management and operations contracts, and the establishment of other mechanisms to avoid asset-stripping and “tunneling”; and (C) privatization. While A and B can be implemented simultaneously, C (privatization) should not be attempted until there has been adequate progress in implementing the first two types of activities. Fortunately, Cuba would be able to benefit from lessons learned from other countries that have gone through similar processes. For ensuring sound investment in generation in the mid-term, it may be necessary to develop an efficient system of capacity payments and/or other policy instruments to provide adequate incentives for investment. a. Analyze the present situation of the power sector in Cuba very briefly, as there are a number of very thorough papers on this subject, including the paper presented by Jorge Piñón Cervera at the 2005 ASCE meetings. b. Calculate very rough orders of magnitude of the investment requirements that would be necessary to rehabilitate the present system and to increase its capacity to support economic growth in the context of a transition to a market economy. c. Discuss the different models for power sector reform and management that have been implemented in other countries in order to put the proposed reforms for Cuba in their proper context. It is assumed that the authorities in Cuba would support reforms that would lead to a system where most investments are made by the private sector and that the role of the state would be limited to the regulatory functions normal for a sector that features economies of scale, scope and density in some of its segments. d. Formulate a strategy and approach for the reform process. A key point is that while many would agree on what the end state of the reforms should be, the path for getting there can be difficult to define, particularly in a country that would be transitioning from socialism to a market economy. e. Identify mid-term issues related to the expansion of the power sector, specifically the development of a system of capacity payments. a. The purpose of the paper is not to be prescriptive but rather to highlight some of the main issues that would have to be faced if a Cuban government takes the decision to reform the power sector. While the verbs “should” and “would” are used throughout the paper, they have been used for simplification. Basically what is meant is that the authorities in Cuba should consider adopting the proposed measures. b. This is a non-technical paper; the intended audience is policy-makers. The power sector cognoscenti will miss discussions of the merits of compensating generators for real power or total power; how to use locational energy pricing, how to compensate for ancillary services such as reactive supply and voltage control, etc. 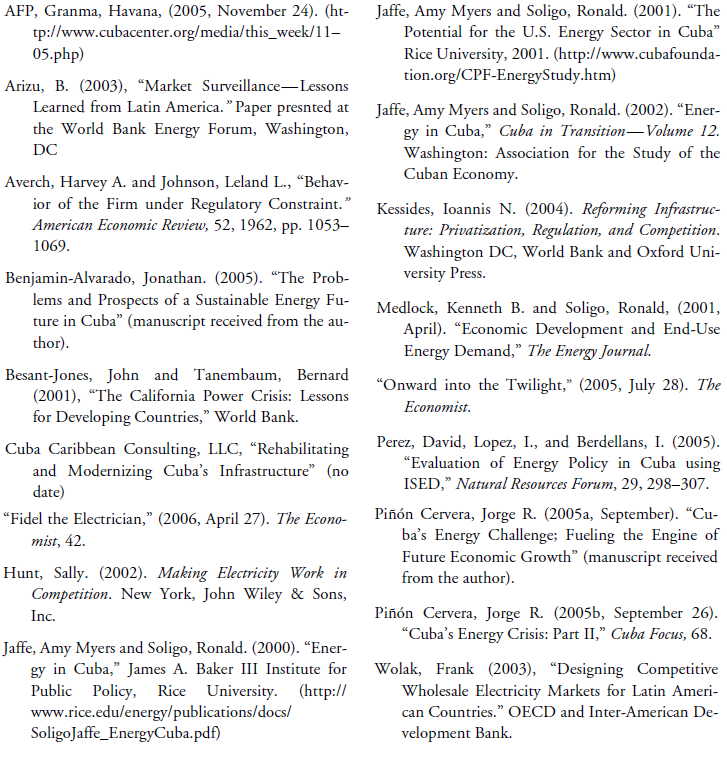 However, the purpose of this paper is not to enter into these discussions but rather to highlight some of the central issues that would face policy-makers trying to modernize the power sector in Cuba. c. Decisions on how to reform the power sector are extremely important, as an adequate power supply is a necessary condition for rapid economic growth. These decisions must be taken by the authorities but international experts can provide valuable advice as the experiences of other countries can inform the decisions taken by the Cuban authorities. d.While lessons from other countries can be valuable, models should not be imported in their entirety but rather they must be adapted to the local conditions. • A well-designed system of capacity payments could ensure that adequate investment in generation takes place in the mid-term. An alternative is to require distribution companies to enter into long-term contracts for a percentage of its total needs. The installed thermoelectric capacity in Cuba is estimated to be 3,057 megawatts plus about 600 additional megawatts recently installed (Piñón, 2005b). In 2002, electricity consumption was 10,400 gigawatts hour (GWh), of which only about 7% constituted renewable sources of energy. Electricity coverage (number of households with electricity as a percentage of total number of households) is claimed by the authorities to be 95%, which is high for a country of Cuba’s per capita income. The major generating plants have deteriorated because of lack of maintenance and because of the use of high sulfur crude oil as plant fuel. The distribution and transmission network has also deteriorated due to lack of maintenance. Additionally, the transmission network has been damaged by hurricanes, the frequency of which has increased markedly in the past five years. System losses have been estimated at 30%, although we have no figure on how much of those are technical and non-technical (Piñón, 2005a). Recently, after the tariff increases, legislation has been enacted to increase severely the penalties for electricity theft, including imprisonment. Mr. Castro insisted all was well in a speech on July 26th, a holiday marking the start of his revolution. He claimed that Cuba’s economy would grow by 9% this year, despite the black-outs and a 40% fall in sugar production. He promised to end the power cuts within a year, to build 100,000 new homes next year, and said that Chinese buses and railway locomotives were on the way. Maybe, but in their current mood, Cubans want more than promises. “Megawatt” is a word that pervades Fidel Castro’s speeches these days. The Cuban president’s lengthy diatribes are now just as likely to dwell on the technical specifications of light bulbs and electricity generators. … Government is importing no less than 4,158 electric generators, many about the size of a standard cargo container, at a cost of around $800m. Some will serve hospitals, factories or schools directly. Others will be plugged into the sagging national grid, currently served by seven big power plants, most using antiquated Soviet technology. The importation of these small diesel generators has some advantages and disadvantages. Main disadvantages are the high capital costs and operating costs (fuel and maintenance); logistics issues related to fuel supply and maintenance; and the difficulty it would present if some of the power is used in the national grid. Main advantages are rapid deployment, thus reducing citizen dissatisfaction; the generators would be subject to low transmission system losses; the power is delivered at the load centers; the approach may be more robust and reliable in the face of natural disasters and; sabotage or acts of war would not cause the same disruption as it would in a more centralized and interconnected system. This solution can only be considered a short term solution. A more comprehensive, long term strategy is needed for developing least-cost generating options and system rehabilitation. A key issue affecting the sector is the low tariff rates. Even after the recent increase, these rates are among the lowest in the world. After the increase, those consuming 300 kwh per month pay less than one U.S. cent/ kwh, while those consuming 600 kwh pay 3.5 U.S. cents (AFP, 2005). Foreigners pay U.S. cents 12.5/kwh, which is probably close to a full cost recovery tariff.2 Even the higher consumption consumers pay rates that are 25–33% of the full costs of generating and delivering the power. The investment requirements should be divided into those that are related to rehabilitating the present system and those that are required to support economic growth (Table 1). Given all the necessary investments Cuba must make to support economic growth, including investment for public goods, it would be very important to pass the “burden” for financing electricity sector investments from the public to the private sector. The rest of the paper will discuss possible actions that could be taken to provide incentives for the private sector to invest in the energy sector, including electricity. Some elements of the power sector have characteristics of natural monopolies, a result of economies of scale, scope and density. Additionally, some of these elements require very high sector specific, sunk investments, and electricity is a product that is massively consumed by captive customers with inelastic demand. As a result, in the absence of some regulation, prices can be higher and quantities lower than in a perfectly competitive market. • Regulators could have an incentive to promise high tariffs, but after the investment is made, to reduce them in order to gain favor with the electorate (temporal inconsistency of policies). In summary, we can conclude that regulators do not have the information or the proper incentives to promote efficiency. If they are captured by the regulated, consumers will pay higher prices and if they are captured by the politicians, tariffs will be set below cost, and the result will be decapitalization and low coverage. This latter result has been observed in many developing countries. To avoid the problems discussed above, a “modern” approach to power sector regulation has been developed. Essentially, the regulatory innovations consist of concentrating regulation on monopoly aspects and deregulating where competition is feasible; and using incentive regulation such as price caps whenever possible. This “modern” approach to power sector regulation was first developed in Chile, and then a similar approach was followed in the England and Wales power market. Eventually, the Chile model, modified and often improved, has been followed in several countries in Latin America, including Argentina (where greater restrictions were placed on vertical and horizontal integration), Peru, Bolivia, Guatemala, Nicaragua, Panama and El Salvador.3 Colombia and El Salvador, however, have followed models closer to the England and Wales power market where electricity is more of a commodity, in contrast to the “Chile model,” where dispatch follows declared costs. El Salvador is in the process of changing its electricity regulatory framework into a marginal costbased dispatch model, so the only country following the “commodity” model in Latin America will be Colombia. • Monopoly (Model 1). In this model there is no competition at all levels of the supply chain (generation, transmission, distribution and commercialization), i.e., a single firm produces and delivers electricity to the final users. These monopolies can be private or state-owned. In Cuba today, Unión Eléctrica essentially dominates all aspects of the power sector. • Single Purchasing Agency (Model 2). In this model, a single buyer or purchasing agency buys electricity from a number of different generators, normally referred to as Independent Power Producers (IPPs). These contracts, referred to as Power Purchase Agreements (PPAs), are reached either through bilateral negotiations or through a competitive process. In quite a few counties, for example, El Salvador and Guatemala, the reform of the power sector began with a state-owned enterprise signing PPAs with IPPs. While these PPAs fulfilled the objective of supplying emergency needs, as the frequency of blackouts was reduced, some have criticized them as being costly, since many of these contracts were the result of bilateral negotiations rather than the result of competitive bidding processes. In systems that introduced competition in generation, the PPAs signed prior to the reforms represent “stranded costs” that are being paid by consumers. • Wholesale Competition (Model 3). This model represents a departure from the traditional way to manage power systems. Basically, an original monopoly is separated both horizontally and vertically. This separation, called unbundling, results in a sector structure with several generators (GENCOS), several distributors (DISCOS), one or more transmission companies (TRANSCOS), and a dispatch center. DISCOS purchase electricity directly from the generators they choose, transmit this electricity under open access arrangements over the transmission system to their service area, and deliver it over their local grids to their customers. The regulator allows competition in generation but regulates the value added in distribution (VAD), i.e., the markup between the wholesale cost of the electricity and the final price paid by the consumers. Regulation of the VAD is normally though a price cap. • Partial Retail Competition (Model 4). This model is like Model 3, but large customers (defined in the regulations) can negotiate prices directly with generators. This adds competition to the system, and also allows large clients with special needs, such as peak demand different from the average consumer, to negotiate terms that are favorable to them and also top the generator. This Model could be the goal for Cuba in 3–5 years after the beginning of the transition. • Full Retail Competition (Model 5). Under this model, all customers can choose their electricity supplier, under open access for suppliers to the transmission and distribution systems. This model has been implemented in California, a market design some argue was unduly influenced by ENRON (Hunt 2002). • Tariff adjustment, protection of vulnerable groups, compensation for claims, and privatization policies must be formulated in the context of national policies dealing with those subjects. In other words, the power sector reforms can only succeed if they are coordinated with the policies guiding reforms in other sectors. • Political stability that ensures legal certainty and consistency of the regulatory framework of the power sector should be maintained regardless of changes in the Administrations. C.Privatization of the state-owned enterprises (SOEs), beginning with the distribution companies (DISCOS) and followed by the generation companies (GENCOS). Perhaps the transmission company (TRANSCO) could stay in the public sector and the dispatch center be owned jointly by market participants. Aspects A and B can be implemented simultaneously. Aspect C, privatization, should not be carried out until the conditions are propitious. These different aspects are explained in greater detail below. It is extremely important at every stage to follow a transparent process, keeping civil society informed. The first necessary step for establishing the rules of the game would be to develop a strategy for the sector, as well as the key policies. This strategy has to be developed in the context of wider privatization and compensation of claims policies. The effort should be led by a group of highly qualified government officials supported by international consultants. Increasing tariffs to reflect costs and develop subsidy schemes for low consumption households (less than 70 kwh/month) would be a difficult but necessary action. Obviously, increasing tariffs for the electricity sector has to be carried out in coordination with other changes in prices.6 The general goal would be to get all prices in the economy, not only energy prices, closer to “international prices.”7 Life line rates or other subsidy schemes would have to be implemented in the context of a broader social safety net policy. Table 2 gives a notional calendar for tariff increase for electricity. While no data are readily available on the full cost of electricity, the table above assumes that costs in Cuba are not too different from costs in other similar countries. The schedule assumes that it would be difficult to adjust tariffs immediately. The goal would be to reach full cost recovery within three years, before the distribution companies (DISCOS) are privatized. Right now, Unión Eléctrica must receive very large implicit subsidies, mostly related to below-market prices for fuel oil and other petroleum products which the Government of Cuba gets from Venezuela. These below-market transfers will almost certainly end if there is a transition to democracy. For the long term development of the sector, it is necessary to develop a legal/regulatory framework. This regulatory framework should protect the interests of the consumers and should protect the investors from “creeping expropriation” through reductions in real tariffs. One very important issue is how this legal reform should be handled in a transition. Should the legal framework be developed only after a democratically elected government is in office? The answer to this question goes beyond the scope of this paper, but flags a very important issue: the trade-off between rapid implementation of polices designed to promote economic growth and the need for democratic legitimacy. Some countries, such as Chile, have chosen to develop very detailed laws that leave almost no flexibility for discretion by the regulator. Other countries have developed laws that are general in nature and that leave the formulation of the details to regulations or by-laws. A decision of which model to follow depends on the legislative practice in a particular country. A more detailed law may give greater certainty to investors but reduce flexibility. On balance, a more detailed law may be preferable in Cuba, as investor lack of confidence could be a key issue for several years. Establishing the institutions for the governance of the sector, principally the regulatory agency, is a key activity. First of all, it is necessary to establish a clear dividing line between policy formulation (responsibility of political authorities, perhaps in a Ministry of Energy, or Ministry of Industry) and the regulatory agency. • Multisector regulator covering most aspects of infrastructure (e.g., Jamaica, El Salvador and Panama). For Cuba, it would seem that a sector specific or even a multisectoral regulator would make sense. The advantage of sector specific vs. industry specific is that the regulator can try to ensure that monopoly aspects in fuel supply do not result in less competition in the energy sector. The advantage of a multisector regulator is that there are some economies of scale, so that regulatory costs may be lower, independence is fostered and that the possibility of capture by one industry (electric, telecom, water, etc.) is reduced. Additionally, the lack of personnel trained in regulation could be a less significant constraint. The regulatory agency must have independence from the political authorities (ministry) and should maintain an arms length relationship with regulated firms, consumers and other private interests. Financial independence through earmarked funding (in many cases a small fee based on a percentage total sales of the regulated enterprises) would be necessary. In order to attract qualified personnel able to deal with industry representatives, salaries may have to be free of normal civil service limits. Independence has many advantages that include reduced regulatory risk, enhanced investor confidence and therefore more investment, and greater revenue from privatization. • Paying competitive salaries to the staff. Independence requires accountability. Accountability can be enhanced though checks and balances; an open decision making process; publication of regulatory decisions and the reasons why they were taken; specific rules prohibiting conflicts of interest; a tight scrutiny of the budget by the legislature, the executive and civil society; and the use of external auditors. The objective of this set of activities is to ensure that the power system continues to operate and to provide adequate quality service during the transition period. It is important to maintain adequate levels of service and commercial performance during the transition period. If service becomes unreliable, customers will not be willing to continue to pay their bills and problems with theft and low collections will occur. In addition, during the transition period, the state enterprises need to maintain reasonable levels of commitment and motivation of staff, and to complete asset inventories and technical studies prior to unbundling, corporatization and privatization. • Implementation of a rehabilitation investment program to ensure safe and reliable operation of the system during transition. Once the basic technical and commercial analysis of the system is complete, the process of “unbundling” and corporatizing separate state-owned companies should begin. It is likely that separate companies for generation, distribution and transmission will be established as independent state-owned companies. The specific number of generation and distribution companies will need to be determined during the transition planning process. The emphasis should be on the distribution and transmission side rather than on generation expansion. This is because the distribution business generates the cash needed to keep the system operating and properly maintained during the transition period. In addition, maintaining good relationships with customers will encourage customers to pay their bills and will discourage theft. It is all too common for distribution to be neglected during periods of civil unrest and transition. When this happens, electricity utilities often begin to decline in terms of commercial performance, maintenance, and eventually in service delivery. An appropriate level of emergency investment in strengthening, upgrading and maintenance in transmission is also likely to be necessary. This is because the transmission system may have deteriorated to a point where transmission constraints would prevent from handling the levels of power transfer needed during the transition process. Emergency investment here refers to the minimum levels required to maintain sound performance of the electricity system during the transition period. One of the important steps during transition is the creation of independent, operationally sound generation, transmission and distribution companies. This allows better corporate governance during transition, and is the basis for privatization of generation and distribution at the end of the transition period. The corporatization process generally takes about 12 to 18 months, depending on the condition of asset records, commercial accounts, and the nature of outstanding liabilities. It is likely that seven to ten generation companies could be formed. For example, new companies could possibly be formed using the existing facilities of Máximo Gómez; Este Habana; Carlos Manuel de Céspedes; 10 de Octubre; Lidio Ramón Pérez (Felton); Antonio Maceo (Renté); and other smaller generation plants. It would appear to make sense to bundle together multiple generation facilities into a single new company to deal with the large number of small generation facilities that have been established, and to enable effective system dispatch and management. However, the exact configuration of new generation companies would be determined based on technical analysis and discussions during the transition period. The possibility of increasing generation capacity through repairs of the damage caused by the high sulfur fuel oil should be explored. One transmission company would seem to be the best approach to the transmission assets. This will ensure that an effective system operator can be developed, and will allow expansion of transmission capacity on a national basis. This will be beneficial to generation expansion after privatization. The transmission company may need to hold vesting contracts with the generating companies during the transition period, and it will also serve as the system operator during transition. It will be important though, that after the reform process is completed, the Government keeps a commitment to not interfere with the management of the transmission company, especially in regards to its budget and technical decisions. There are currently fifteen distribution companies in the country. There is no specific set of technical rules or guidance about the optimal size of distribution companies, and many different approaches have been taken world wide. For example, Norway has almost 300 separate companies, while the Argentine system has only twenty-two. Given the geographic features and placement of load centers in Cuba, it might be most sensible to consolidate the fifteen distribution companies into five, corresponding to the main load centers. This provides better scale for operations and will be more attractive to qualified international electricity investors. Management contracts for different entities before privatization can be carried out. It is very important to maintain a well functioning electricity system prior to privatization. This prevents a number of problems that can occur during a transitional period, such as asset stripping through theft, “tunneling,”8 poor maintenance of facilities, and customer frustration, which often leads to the vicious cycle of declining payment discipline, falling revenues, and inadequate funds for operations and maintenance. To ensure a well functioning system during transition, it may be necessary to operate the system through a number of competitively awarded operating contracts, probably with separate contracts for generation, transmission and perhaps for distribution. Although management contracts for utilities have tended to produce less improvement in performance than privatization, they are a useful tool to keep the system running during transition. In addition, the private operators can be assigned key tasks associated with quick transition, such as customer enumeration, asset inventories, and management of the transitional rehabilitation investment program. However, it is clearly essential to make these contracts “incentivebased,” meaning that the operators receive strong incentives to maintain the best possible performance of the system—both technically and commercially. In the past decade, there has been substantial improvement in the design of incentives under these types of contracts, and the best practices from other countries can be used in the Cuban transition. The duration of the operating contracts would probably be about 36 months, corresponding to the time needed to unbundle and corporatize the system, and to adjust prices toward reasonable starting levels of cost recovery. It is important to emphasize that the purpose of the private operating contracts is to stabilize the system during transition, to prevent a rapid deterioration of assets, services and customer relationships, and to accelerate the process of unbundling and corporatization. Whether or not there are short-term operating contracts issued depends in large part on an assessment of the competence, honesty and motivation of incumbent electricity utility managers at the start of the transition process. A quick judgment will need to be made at the highest level of government and by donor agencies as to whether private operating contracts will be necessary. Given the disruptions that are likely to occur at the beginning of the transition process, our initial assessment is that these contracts would dramatically improve the performance of electricity entities during transition. It is worth mentioning that the common incentive designs that are proving to be effective for operating contracts generally have some kind of base fee that covers the operator’s basic costs, and then an incentive fee that is based on performance in areas that are most important to the utility, such as collection efficiency, cash generation per unit of electricity input to the system, or gross profit. Examples of electricity operating contracts that are worth examining in designing the Cuban operating contracts might include the Kosovo and Georgia management contracts, as well as the Casablanca, Morocco electricity lease, and the New Delhi, India five-year transitional loss-reduction framework that was used for transition during distribution privatization. Privatization of the power sector assets must be coordinated with the national privatization strategy; privatization generally is one of the most important and difficult endeavors in a transition from socialism to a market economy. Also, issues related to compensation may have to be addressed, and these are will be very complicated and controversial. It is beyond the scope of this paper to discuss broader issues of privatization, so it will be assumed that the broad policies and methods of privatization have been settled. This section of the paper will discuss a sequence for the privatization of power sector assets that is based on best practices. Power sector privatization should begin with the sale of the distribution companies (DISCOS). This would take place after the companies have been strengthened and more importantly, after tariffs have been increased to a level close to or at full cost recovery. Privatization of the generation assets could then proceed. The main reason for proposing this sequence is that it is important to have viable distribution companies, with tariffs accepted (albeit reluctantly) by customers before the generation companies (GENCOS) are privatized, as the financial viability of the GENCOS is almost totally dependent on the viability of the DISCOS, their main clients. Countries in Latin America that implemented reforms (Models 3, 4 and 5) expanded their power systems rapidly. A good example is Guatemala, where generation increased from 1,145MW in 1996 to more than 2,000 MW in 2006, and electricity coverage (percentage of households served by electricity) increased from 47% in 1996 to 83% in 2005. However, since that time, foreign investors have shown a marked decline in their interest in Latin America. It is impossible to forecast what the mood of international investors will be at the time of the expected transition. An important mid-term issue is assuring adequate electricity supply in Cuba. At this time, countries are devising regulations to improve the system of capacity payments that would encourage new investments in generation.9 A notable example is Colombia, where a new system for capacity payments is being developed with support from USAID.10 Four of seven U.S. markets and most Latin American markets have or are developing separate capacity markets and related charges. These markets recognize the value of capacity as an element of reliable service, i.e., absent adequate capacity to serve customer demand some level of load would be unmet and service curtailments reducing service reliability would be required. The thinking on capacity payments is developing and Cuba will be able to benefit from the experience of the U.S. and of other countries. Another policy tool used to encourage investment in generation has been to require distribution companies to enter into mid-term and long-term contracts for a large percentage of their total forecasted sales. This system has been used in some countries in Central America. During more than forty years, the Cuban people have suffered a lack of political and economic freedom, and the country has stagnated. A political and economic transition is inevitable. When it comes, Cuba could benefit from the experiences of other countries. In the case of the power sector, the most interesting lessons may come from Latin America. The greatest professional ambition of the author of this paper is to participate in some way in the liberalization of the Cuban economy, including the power sector. Many developing and transition economies lack some of the features required for competitive wholesale electricity markets. First, more than 100 countries have less than 1,000 megawatts of installed capacity—so unless there are strong connections to neighboring countries, the potential number of independent suppliers might be too small to support a competitive market (Besant-Jones and Tenenbaum 2001). Moreover, many medium-size and large countries have not undertaken sufficient horizontal restructuring in generation to mitigate problems of market power. Second, transmission networks are often poorly suited to wholesale competition. And third, most developing and transition economies have had a hard time establishing effective, credible regulation. Under these circumstances a bid-based short-term (spot) market, where generators submit supply curves (indicating the quantity of energy they are willing to provide as a function of price) or multipart bids, might have disadvantages. The most obvious ones are the potential exercise of system wide market power due to insufficient competition in generation or of local market power due to transmission bottlenecks in specific areas. If either outcome occurs, prices will likely be well above the marginal cost of the most expensive generator in the market (for system wide market power) or in the specific area (for local market power). Thus potential market power problems must be carefully analyzed before a bid-based shortterm market is introduced. If these problems are significant, the new market should be accompanied by strategies that mitigate them. Creating such strategies is a challenge even for experienced regulators. Another disadvantage of a bidbased short-term market is the high start-up cost of the required real-time metering equipment, information technology, bidding protocols, and marketmaking and settlement software. For example, establishing California’s spot market for electricity cost $250 million. Even a small bid-based real-time (or near-real-time) market entails significant up-front costs (Wolak 2000). Thus in many if not most developing and transition economies it might be unwise to establish bid-based dispatch. A safer strategy might be to pursue, at least initially, a cost-based spot market where generators are dispatched based on their marginal production costs—so the marginal cost of the last unit called to meet demand determines the market clearing price. Almost every country in Latin America uses regulated unit-level costs to dispatch electricity and set prices (Colombia is an exception). • Ensure economically efficient dispatch (assuming generators are truthful in revealing their production costs). • Make it harder for generators to exercise market power (because they must bid their regulated costs) and so avoid the time and expense of developing tools to mitigate it. • Are easier to implement because they build on mechanisms that were in place prior to reforms and avoid the start-up costs of real-time bidbased systems. By constraining the exercise of market power, costbased mechanisms also reduce short-term variation in electricity prices. Lower volatility cut costs for suppliers and load-serving entities because there is less uncertainty about prices over the duration of forward contracts (Wolak 2003). But cost-based dispatch also has disadvantages. First, it does not eliminate the incentives or ability of suppliers to exercise market power (Arizu 2003). Suppliers may try to inflate their estimated or actual production costs, so the exercise of market power simply takes a different form. Thus an administrative procedure is needed to determine whether suppliers’ input costs are prudent, which requires careful monitoring of fuel and other input markets. In many developing and transition economies, however, auditing is weak. Second, cost-based dispatch offers a simulated spot market for electricity, not a real market. The price signals it provides to market participants are not as powerful as those in bid-based spot markets. For example, in a bid-based market the owners of hydroelectric units raise the price of their electricity if they anticipate water scarcity. In response, fossil fuel units will likely run more intensively much sooner, reducing the likelihood of electricity shortages. 1. The views expressed in this publication are those of the author and may or may not necessarily reflect the views of the United States Agency for International Development or the United States Government. The author benefited greatly from conversations with Allen Eisendrath (USAID); he also drafted the section of the paper dealing with the strengthening of the SOEs during the transition, an area where he has done pioneering work. Walter Hall (USAID) provided multiple comments and particularly researched the state-of-the-art in capacity payments in the U.S. Jeff Haeni (USAID) assisted with research and provided very useful comments. Patricia Flanagan (USAID) identified bibliographic references related to non-renewable energy sources. The following USAID colleagues provided comments: James Elliott, James Walker, David Dod, Anthony Chan and Steve Tupper. The following outside reviewers provided comments: Silvia Alvarado de Córdoba (Globeleq), John Hammond (U.S Energy Association), Ignacio Rodriguez (PA Consulting) and James Sullivan (Energy Markets TL International). Roger Betancourt (University of Maryland) commented the paper at the ASCE Meetings. All errors are the responsibility of the author. 2. A rate of U.S. cents 12.5 would be close to full cost recovery with oil prices of around U.S. $25 a barrel. At present prices, the cost is significantly higher. 3. The author of this paper was involved in supporting these reforms efforts while being the Chief Economist of USAID in several countries in Central America and later when he directed USAID’s assistance program for Central America. 4. This typology is a simplification, and all models have nuances and “sub-models.” For example, in some countries, state-owned enterprises have been corporatized and subjected to additional discipline, including hard budget constraints. 5. The Annex provides the arguments for this approach. 6. The theory of the second best suggests that when two or more markets have distorted prices, then efforts to correct only one of the distortions may in fact drive the economy further away from Pareto efficiency. 7. There is a lot of discussion in the literature on economic transitions on whether it is more advisable to adjust prices very fast (“shock treatment”) or to do it gradually (“gradualism”). A discussion of this is beyond the scope of this paper. 8. Tunneling is a colloquial for financial fraud committed by a company’s own management or major shareholders, consisting of illegally pumping out valuable property into their own, private firms. The term “tunneling” was probably first noted in this context in the Czech Republic (tunelování in Czech, tunelá for the fraudster) during the first half of 1990s, when first of large, previously privatized banks and factories went bankrupt with huge debts and bank accounts virtually empty. It was discovered later that managements of such were deliberately transferring company’s property and real estate into their own, private businesses, sometimes in offshore locations (Wikepedia). 10. The Government of Colombia is receiving support for this by USAID in partnership with the U.S. Energy Association (USEA). 11. Extracted from Kessides, 2004.